Stuart joined Aviva in 2001 and has held a number of roles all associated with operations and delivery of services, including property and facilities and document management. His current role includes all operational property and facilities activity across the Aviva Group including property acquisitions and disposals and all aspects of facilities management. Stuart has worked closely with a number of service providers and brings a strong operational experience of the way in which these can be managed for mutual benefit. He has worked for Aviva outside of the UK, managing a wide portfolio of property-related projects including addressing the environmental impact of buildings as part of the acquisition process. Stuart’s portfolio includes energy management where Aviva has good experience of the issues of driving down consumption whilst acquiring energy in an environmentally responsible way. Before joining Aviva, Stuart spent some time at PA Consulting Group but prior to that served in the Royal Engineers. He has a Civil Engineering degree which provides a broad understanding of a number of aspects of the built environment and their impact on modern life. Stuart spent some time as a member of the Norwich Chamber of Commerce and is Governor of a Norfolk High School. Jenny joined KPMG as a public sector audit graduate in 2007, qualifying as a chartered accountant in 2010. In 2011 she joined the KPMG Corporate Responsibility team taking on a variety of roles before moving into External Affairs in 2016 as Head of Social Mobility. As Head of Social Mobility, Jenny developed and executed KPMG’s social mobility strategy across the firm. Jenny is regularly consulted by Government and advises KPMG clients, suppliers and the wider business community on social mobility policy within a business context. In October 2018 Jenny became Co-Head of Inclusion, Diversity & Social Equality for KPMG. In 2016 KPMG was appointed by Government as one of the 11 founding Social Mobility Champions. In December 2016 KPMG was the first firm to publish comprehensive workforce data on the socio-economic background of its workforce. In 2017 KPMG was an inaugural winner of The Queen’s Awards for Enterprise: Promoting Opportunity (through social mobility) and won the Leadership of the Year award at the first Social Mobility Awards and later in 2018 KPMG was awarded the number one spot in the Social Mobility Employer Index. Jenny is a Board Trustee for the East London Business Alliance and a School Governor for Orleans Park School. Stephen Uden is Head of Corporate Citizenship for Nationwide Building Society, the UK’s largest building society. For the past 12 years, Stephen has worked on programmes to create economic opportunity through skills, education and regional development. Stephen joined Nationwide in 2012 from Microsoft where he was responsible for the Britain Works programme that helped train 500,000 people over three years. At Nationwide, Stephen is responsible for the organisation’s citizenship activities. Loraine has recently joined Network Rail as its first Director of Diversity and Inclusion, and will lead on making the rail industry a more open, diverse and inclusive business. Network Rail is responsible for the rail infrastructure, which includes engineering, the maintenance of tracks and flagship stations like Kings Cross. It has 34,000 staff throughout the UK. Loraine is a director of her own business Merit Works, a management consultancy that offers expertise on strategic leadership, diversity and inclusion and organisational change. Her consultancy has worked with global businesses including BP and Arup, particularly in South Africa. Before setting up her own business, Loraine lead two priority areas, equality and inclusion and employment and skills, in the construction of the Olympic Park, infrastructure, venues and facilities for London 2012, for which she has been awarded an MBE. Peter Kelly has been active in campaigns for social justice for more than 20 years, both as a worker and activist. He joined the Poverty Alliance as Policy Manager in overall day-to-day management of the organisation, as well as leading on the policy and campaigning goals of the network. Peter also represents the Alliance in a variety of forums and networks including Glasgow Council for the Voluntary Sector, the Scottish Drugs Forum, Energy Action Scotland and others. He is currently Vice President of the European Anti-Poverty Network. He has been a member of a number of official advisory forums including the Scottish Government's Tackling Poverty Program Board and the DWP's Social Inclusion Advisory the Alliance. Before joining the Alliance he worked at the Scottish Low Pay Unit, helping to campaign for the introduction of the National Minimum Wage. 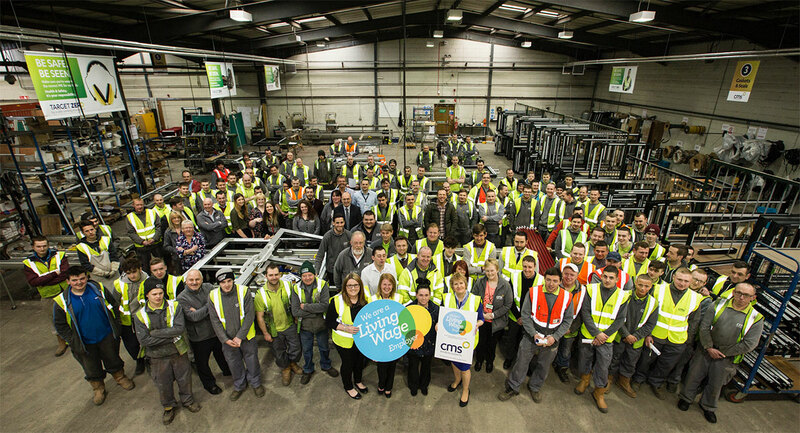 The Poverty Alliance hosts Living Wage Scotland which awards the Living Wage Employer mark to employers in Scotland. Paul Regan is a Methodist Minister based in Newham where he has lived since 1972. He is chair of the Social Responsibility Commission of the Methodist London District. He was Director of the Renewal Programme from 1977 to 1994. He then became Chief Executive of Aston-Mansfield – a merger of two Victorian charities - until his retirement in 2005. He has an interest in social enterprise and has set up several charities including Landmark Training which he has chaired since 1981 and Conflict and Change established in 1984 – the first community based mediation service in the UK. He is a trustee of London Catalyst, London Citizens and vice-chair of CitizensUK. Peter McOwan is currently Vice Principle a for external partnerships and public engagement and Professor of Computer Science in the School of Electronic Engineering and Computer Science at Queen Mary, University of London. His research interests are in visual perception, mathematical models for visual processing, in particular motion, cognitive science and biologically inspired hardware and software. He has authored more than 100 papers in these areas. He recently served on the Program Committee for ACII2009, CVPR 2009 and IEEE Artificial Life and is a member of the editorial board of the Journal on Multimodal User Interfaces. Pamela joined Burberry in 2012, and has 20 years of experience from across the field of Corporate Responsibility, including serving on the board of the Ethical Trading Initiative for 6 years. The Ethical Trading Initiative (ETI) is a leading alliance of companies, trade unions and NGOs that promotes respect for workers' rights around the globe. Whilst at Burberry, Pamela built a global team of sustainability specialists focused on Burberry’s own operations and supply chain, ensuring responsible and sustainable business management. Matt's first stint in Corporate Responsibility was with Barclays where he delivered the bank's community affairs programme in the West Midlands before taking a role leading all national sponsorships and volunteering. This included devising and developing the award-winning Barclays Spaces for Sports, still the UK's largest ever community sports sponsorship. Looking to get a view from the other side, he moved to regeneration charity Groundwork in 2005 where he was responsible for setting up a new branch in Corby: Groundwork North Northamptonshire. Over three years, the charity grew to 15 staff and a £750k turnover, focusing on youth work, community development and CVS support. Moving to Linklaters, he led their global community investment activity for three years and, latterly, has taken additional responsibility for all corporate responsibility activities. Paul Sellers is the TUC’s Pay Policy Officer. He has been involved in the Living Wage campaign since its early days. Paul’s other responsibilities include leading on the National Minimum Wage, holiday pay and working time issues. The TUC has adopted the Living Wage as a key target in its campaigning work. Laura is a Senior Research and Policy Analyst at the Resolution Foundation, a think tank that works to improve the living standards of those in Britain on low to middle incomes. Her work at the Foundation has focused on analysis of the labour market, including pay trends, self-employment and the social care workforce. She now specialises in intergenerational issues, and is secretary to the Intergenerational Commission. Prior to joining the Resolution Foundation Laura spent four years at the Centre for Economic and Social Inclusion, where she worked on unemployment, young people, welfare reform and housing. Mari joined Cynnal Cymru - Sustain Wales in 2014 following a career in marketing and business strategy. For eight years Mari was a marketing consultant for the Welsh Government advising start-ups in Wales and supporting the relationship between Wales and China. Mari has also established two businesses in Cardiff and is passionate about fair pay. Cynnal Cymru - Sustain Wales is the national charity for sustainable development and in 2016 became the Living Wage Accrediting Body in Wales. Claire is Director of Corporate Services for JRF and JRHT. She provides leadership to the corporate services team which includes People and Internal Communications, IT, Health and Safety, Governance and Financial Services. Prior to joining in 2013, Claire was HR director for a national charity that provides services to tackle problem drug and alcohol use and worked for Motorola in a variety of senior European HR roles. Claire is a chartered member of the Chartered Institute of Personnel and Development, Chair of Governors for New Earswick Primary School, and has a BA in Economics from the University of York. Susan Stewart became Group HR Director for Nestlé UK and Ireland in July 2015. In her current role, Susan leads a 165 strong function that provides strategic HR leadership to all Nestlé Group businesses which total over 8,000 people at 20 office, manufacturing and distribution sites. Prior to joining Nestlé in the UK and Ireland, Susan held senior HR roles within Nestlé USA. Susan initially joined Nestlé Dreyer’s Ice Cream in Oakland, California as Director of HR Operations in 2009, a role she held for two years. Susan was then appointed Vice President Human Resources, Nestlé Prepared Foods, Solon, Ohio, where she led the HR team as well as Facilities and Communications teams. In December 2012 Susan returned to Nestlé Dreyer’s Ice Cream in the position of Vice President of HR, a role spanning 4,000 employees across multiple locations within the US market. Susan is a passionate advocate for diversity and inclusion. Within Nestlé, Susan has been an active champion of the Company’s Women’s Network and helped to successfully expand Nestlé USA’s Diversity Leadership Symposium which resulted in a 50% increase in diverse hires across the business. John is Chief Executive of People’s Health Trust. Through its funding and support, the Trust encourages resident-focused approaches as a means of addressing the underlying structural causes of health inequalities. He is a member of the Advisory Board for NIHR’s School for Public Health Research and Chair of the Living Wage Friendly Funder Committee for the Living Wage Foundation. John was previously the Deputy Head of Programmes for Big Lottery Fund's £500m health programme, ran his own business for several years and headed up V's £100m corporate match fund programmes. As well as leading operations planning at both Big and the Care Quality Commission, John also worked in learning disability/mental health services, where he set up and ran a community resource centre, and was once the CEO of Graeae Theatre Company. Kirsty joined Oxfam in 2014 as Head of Wales. In this role she lead Oxfam's Cymru's programme, policy and advocacy, delivering an integrated programme seeking to address and challenge the injustice of poverty. During this time, Kirsty also Chaired the Disasters Emergency Committee in Wales. In 2018 Kirsty was promoted to be the Head of UK Programme at Oxfam, overseeing the UK wide programme which includes domestic as well as international advocacy and Global Citizenship Education. Prior to this Kirsty was Deputy Director at Wales' leading think tank, the Institute of Welsh Affairs. As well as being a local councillor and then Cabinet Member for Social Services, Kirsty was also the founding Chair of the Women's Equality Network in Wales. With a strong background in politics and local government, Kirsty brings a strong commitment to ending the injustice of poverty, locally and globally, making it central to public and political life. Kim Healey joined Everton as Head of Human Resources in 2015, having had more than 15 years’ experience of leading HR functions at Wigan Athletic and Blackburn Rovers. She played an integral role in Everton entering The Sunday Times 100 Best Companies to Work For list for the first time in February 2018. Kim was promoted to the position of People Director in June 2018. The creation of this position is recognition, that to be successful, we need to attract and retain the best talent on and off the pitch. As People Director, Kim aims to create an inspired, inclusive and diverse workplace where everyone can work to their full potential.She has responsibility for employee engagement, wellbeing, learning and development, safeguarding and equality and diversity, ensuring best practice is followed across the business. Kim’s prominence in HR has seen her become fellow member of the Chartered Institute of Personnel and Development.